Nano-TiO2 particles with high strength and hardness are incorporated into cementitious composites to reinforce/modify their properties/performances. The effects of type, content, and particle size as well as surface treatment of nano-TiO2 on the mechanical properties/performances of cementitious composites are investigated. The enhancement mechanisms are analyzed through zeta potential, water vapor adsorption, contact angle, thermogravimetry, X-ray diffraction, nuclear magnetic resonance, and scanning electron microscope tests. The effects and modification mechanisms of nano-TiO2 on the rheological, durability, and electrical properties/performances of cementitious composites are also studied. 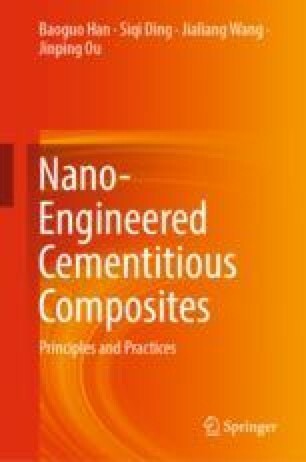 Experimental results indicate that all types of nano-TiO2 present an obvious impact on the properties/performances cementitious composites because of their excellent mechanical characteristics and dispersibility in combination with nucleation and filling effects.